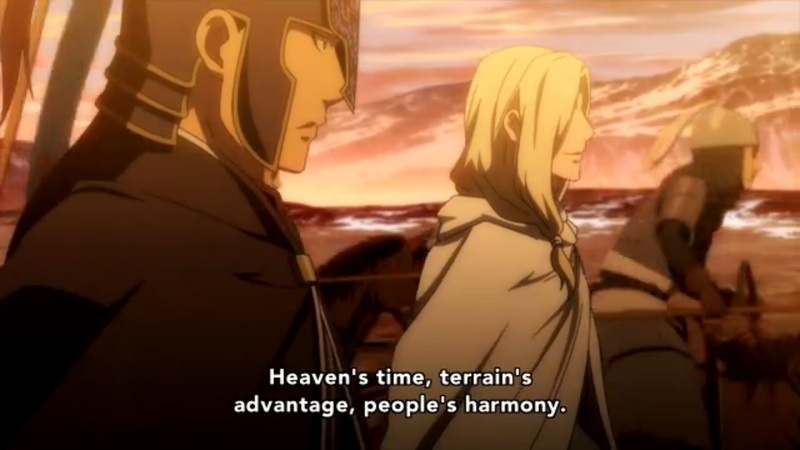 And so at last, the show shifts its focus from the flight of Arslan and his companions from the Lusitanians to Arslan commanding what remains of Pars’ forces in an (eventual) attempt to retake the capital. Unfortunately, this is not a clean, purposeful shift, but the kind that causes worrying noises from the transmission and a whiff of smoke to fill the air. 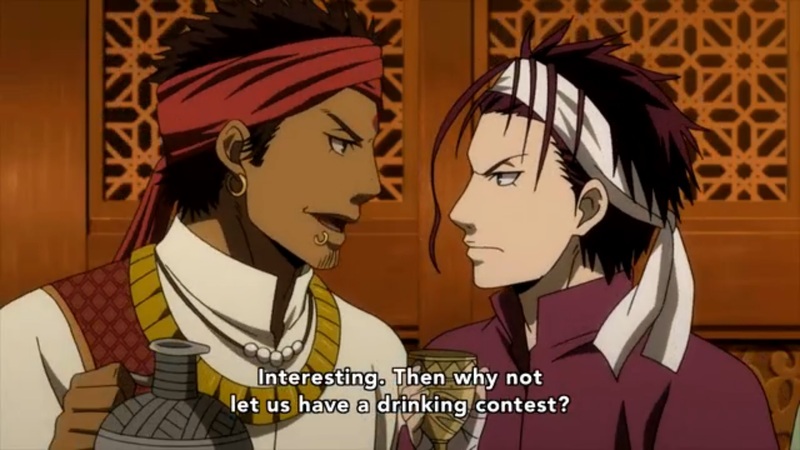 The problem starts almost immediately, as Narsus and Daryun convince Arslan to stay behind while they go out to fight Sindhura. 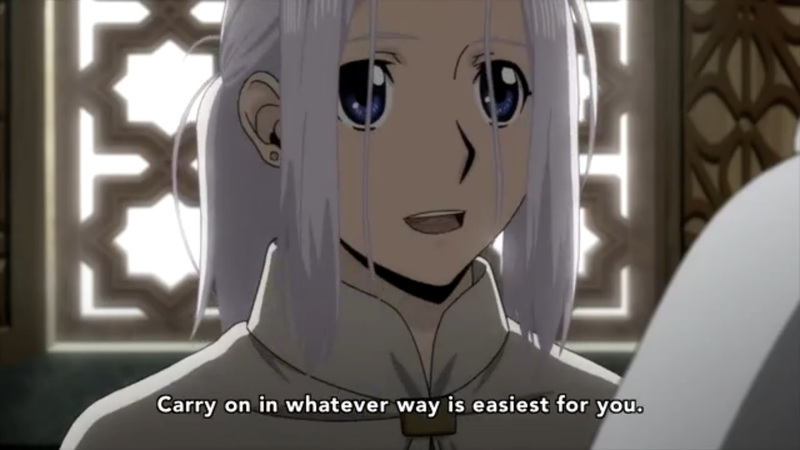 It’s meant to be a moment in which Arslan learns the value of trusting his subordinates to do their jobs without his oversight, but falls flat – the whole show has been about Arslan relying on his (much more skilled) subordinates to do everything! 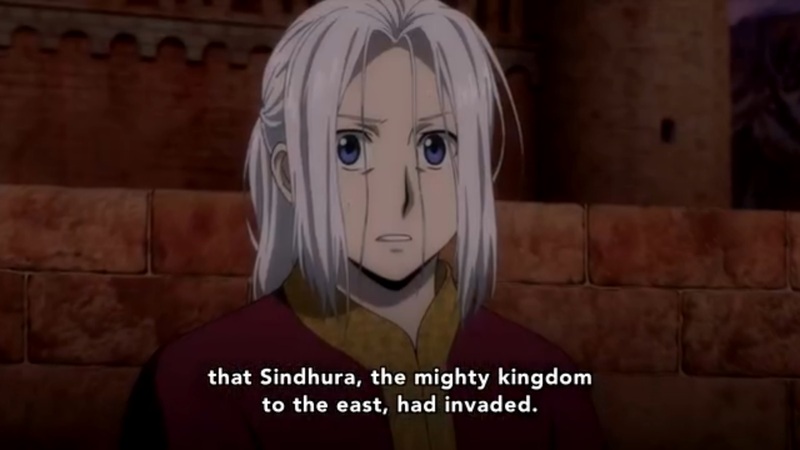 What exactly is Arslan supposed to learn as he sits back in the fortress and waits? 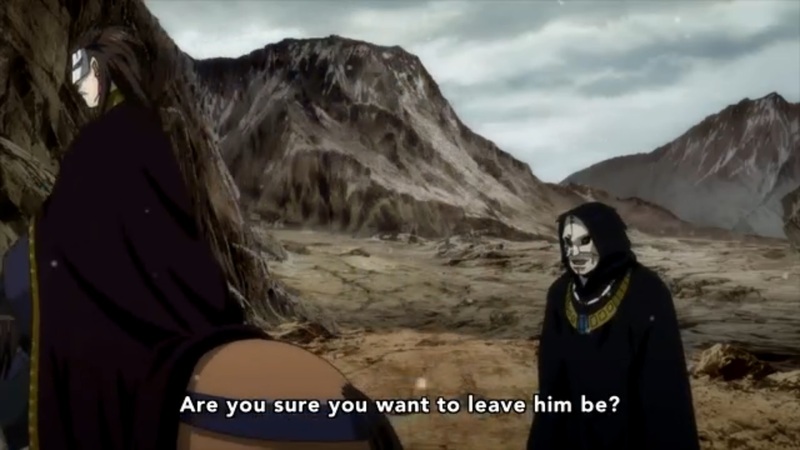 Readers who remember the events of last episode (two long weeks ago due to the recap episode last week) will recall that Hermes, the Silver Mask, had just escaped after nearly killing Arslan, despite the presence of his entire squad of retainers. Hermes also knows how to get inside the fortress almost effortlessly. Why in the world are the two best fighters in Arslan’s squad, as well as the skilled fort commander Kishward, leaving him here relatively unprotected? Fortunately for Arslan, Hermes just turns around and leaves for Ecbatana rather than picking this low-hanging fruit, giving no explanation to his baffled subordinate (or to baffled watchers, myself included). With Arslan firmly off-camera for the majority of the episode, we instead watch Narsus defeat Rajendra’s army on the battlefield. While there, Narsus gives an important description of the three critical elements of strategy a commander must know. Basically, these are 1) whether the troops are accustomed to the local climate (“heaven’s time”), 2) terrain advantage, and 3) morale/army cohesion/trust (“people’s harmony”). Sindhura, in using desert-bred troops to attack on unfamiliar terrain during winter, already violates 1 and 2. 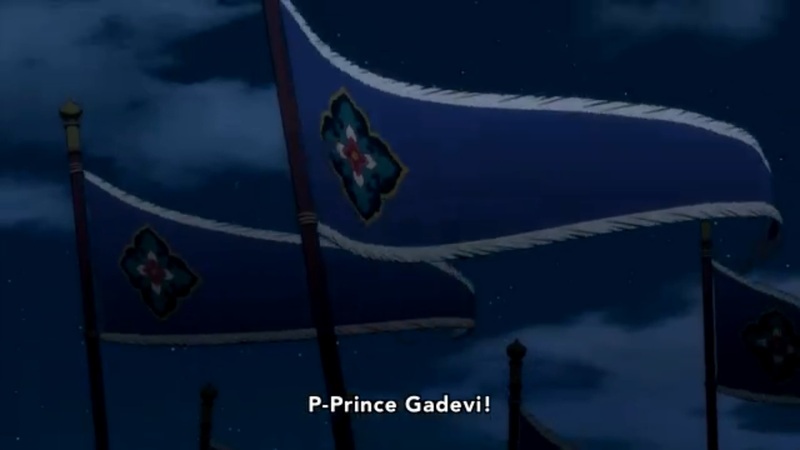 What really turns the tide, though, is that Narsus is aware of the power struggle in Sindhura, and sets up a bunch of dummies in Gadevi’s garb and flying Gadevi’s banner to make Rajendra’s army think they are under attack by their fellow countrymen, along with using Sindhuran bows and arrows to attack them. 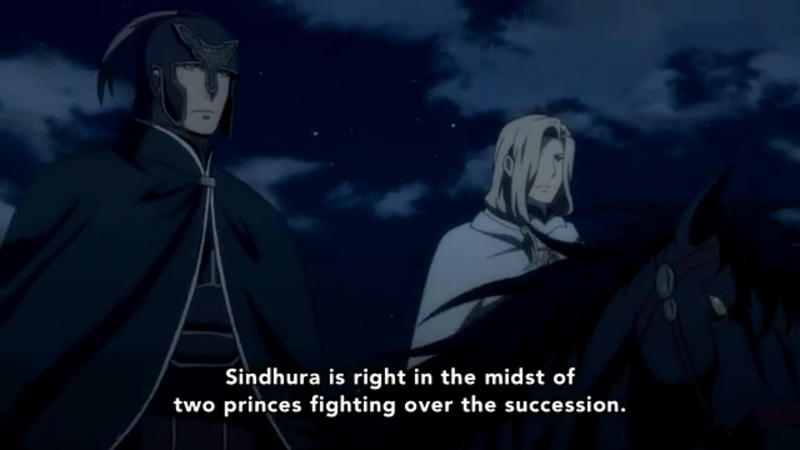 This combined attack routs the Sindhuran army, and is a perfect example of the kind of knowledge, strategy, and unconventional thinking that will be crucial for Arslan to pick up. Which is why Narsus is explaining this brilliant plan to Daryun. Arslan, presumably, is spending this time teaching his falcon some kickin’ battle strategies to use against the local mice. I’m starting to wonder why this show isn’t called The Heroic Legend of Narsus. This victory also somewhat strains credulity, however. Narsus has spent most of his recent life secluded in the mountains, painting. Somehow, while on the run, nonstop, from Lusitania, he has found the time to get a detailed picture of the internal politics of Sindhura, as well as knowing from scattered scouting reports which of the brothers is attacking. On top of that, Peshawar Fortress apparently keeps a large supply of Sindhuran weaponry lying around, in addition to the uniforms and flags carried by each of the warring brothers. Only with all of these elements put together, plus an understanding of Rajendra’s reckless nature, is the victory possible. If this had been an invasion we had progressively tried to counter, learning more about the enemy over the course of episodes, I could have understood it and enjoyed it a great deal. 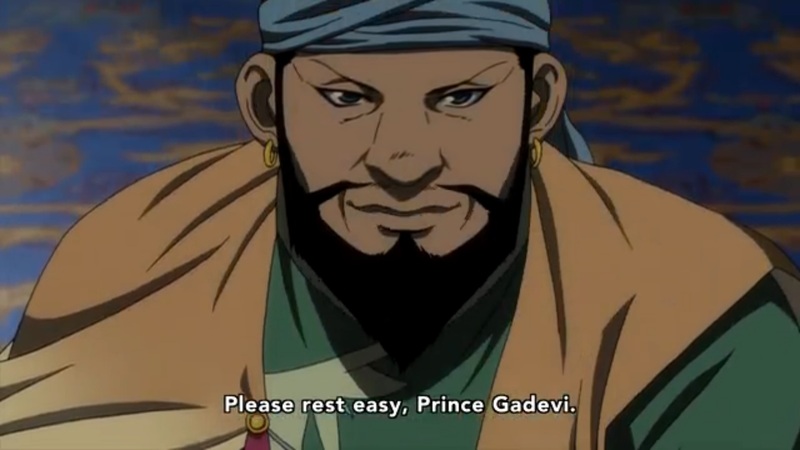 To have a massive attack not just stopped but completely routed, its leader captured, and an Arslan-Rajendra alliance made within the same episode is absurd. … but it’s obvious that most, if not all, of the negotiation tactics were thought up by Narsus. I’m definitely getting concerned that the story of Arslan’s growth is going to get lost as we follow the plans of greater men. The episode concludes as the combined army marches toward Sindhura (and Gadevi’s incredibly trustworthy Grand Vizier advises him on the spy he already has in Rajendra’s army).